Tired of the same old burgers and brats? 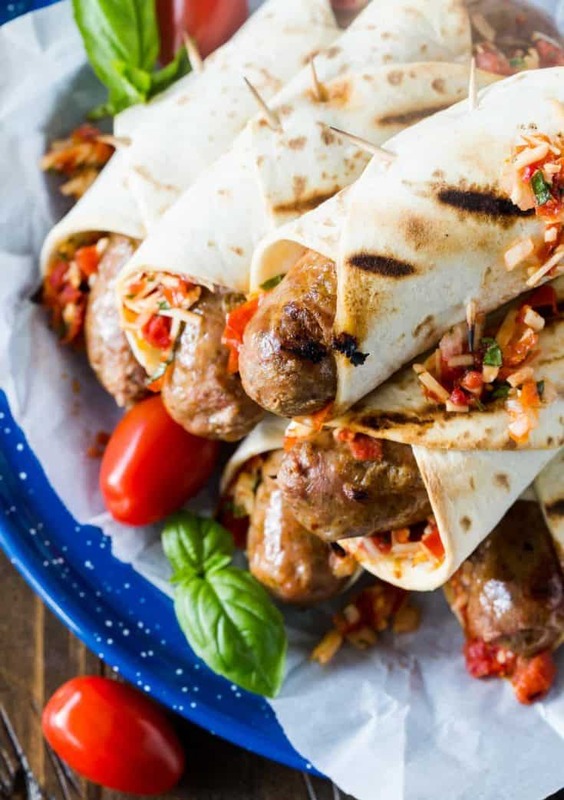 These Grilled Italian Sausage Wraps are topped with a tomato bruschetta mixture, wrapped in flatbread and grilled until warm and crispy – perfect for your next BBQ! Nothing says the 4th of July like a BBQ with friends and family. We love to grill in the summer, even more so on holidays, and we’ve enjoyed everything from salmon and steaks to burgers and brats at our July 4th parties over the years. But these Grilled Italian Sausage Wraps stole the show last year. It’s pretty easy to understand why. Perfectly seasoned Italian sausages are an ideal match for the savory bruschetta topping. Roll everything in a flatbread and grill until just crispy. My favorite part? The flavors don’t get lost in some oversized bun. Since everyone always asks to help in the kitchen, put your friends and family to work with these Grilled Italian Sausage Wraps. Set up an assembly line and give everyone a job: cut the flatbreads to size, add the grilled sausages, top with bruschetta tomato mixture, roll everything up and secure with toothpicks. 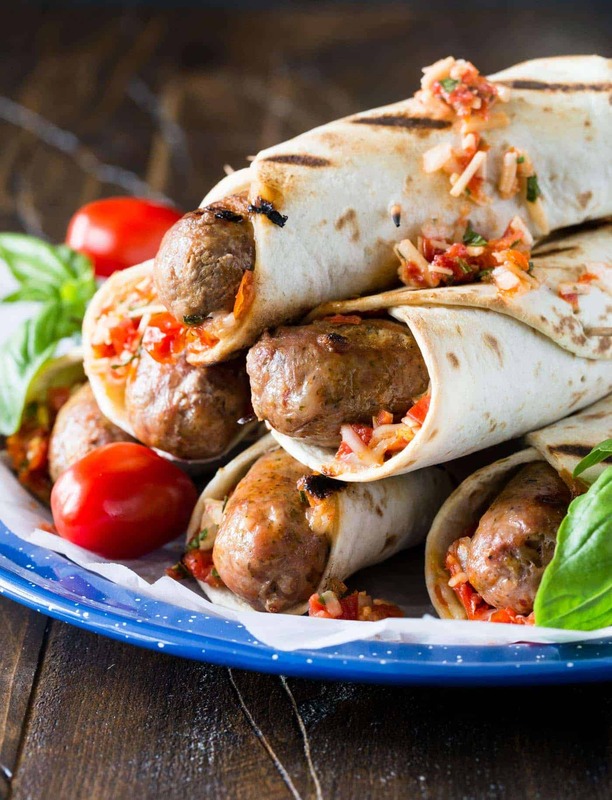 After a quick visit to the grill, these Grilled Italian Sausage Wraps are ready to eat. A few words about the ingredients. You’ll see flatbreads and roasted tomatoes mentioned in this recipe. Both of these items are available at my favorite grocery store. But if you don’t have them at your store, feel free to substitute. A tortilla can easily be swapped for the flatbread. I think a thinner, flexible naan bread or pita would work well, too, if you wanted more substantial bread around the sausages. The tomatoes are oven-roasted and packed in oil (please note these are NOT sun-dried tomatoes in a jar). The roasted tomatoes I buy are made by Divina, and I find them by the olive bar at my grocery store. If you have the time and desire, you can roast your own tomatoes and store them with a drizzle of olive oil on top until you’re ready to use them. (Here’s a simple recipe for roasting your own grape tomatoes from Katie at Katie’s Cucina.) Or I’m convinced a fresh well-drained bruschetta topping would also work beautifully. Play around with it and find what works for you. I’m confident you’ll have tasty results. Make Ahead Tip: For those of you who like to do as much meal prep ahead of time as possible, know that the tomato mixture can easily be made in advance. Even the sausages can be cooked before guests arrive if necessary. Remove them from the fridge about 20-30 minutes before you preheat the grill and rewarm them in the tortillas directly on the grill. Craving more grilled sausage recipes? Don’t miss these! Combine tomatoes, cheese, onion, basil and garlic in a small bowl. Set aside. Grill sausages to until cooked through. Keep warm. Place one sausage on one of the flatbread halves. Place 1/4 of the tomato mixture on top. Roll up the flatbread and secure with toothpicks. Repeat with remaining sausages. Grill 2-3 minutes or until flatbread is crispy, turning once. Serve warm. This is such a great recipe, I mean really great. Totally trying this soon as I love wrapping up sausage like this with cheese! Hope you enjoy it as much as we do, Cathy! These look incredible! LOVE that you wrapped the sausage in flatbread! The flatbread gives it a great crunch…unexpected yet so yummy. Hope you try them soon, Becky! This take on grilled sausage is genius, I will be making this for my husband, the sausage-lover-extraordinaire! Hi Sally, so glad you found us! Thanks for your kind words. I hope your husband enjoys the grilled sausage wraps. Happy 4th of July! Yum! Isn’t roasting tomatoes the best! I can’t get enough of them! I think my husband will love this recipe! Looooove roasted tomatoes! And so glad I included your recipe so others can try it, too!